Leave it to Viviane Bauquet Farre to transform a beloved comfort food — the grilled cheese sandwich — into an amazing gourmet dish. This cook extraordinaire has done so by using what she dubs a “secret ingredient”: peeled garlic cloves cooked slowly in extra virgin olive oil. While you can use other types of oil, Viviane prefers extra virgin olive oil to make the garlic confit. “Since the temperature of the oil doesn’t get too high, its natural flavor is preserved and then slowly imbued with the delicate garlic flavor as the cloves cook,” she says. We’d use our Everyday or Arbequina oils. Viviane recommends using the leftover oil in salad dressings and marinades. It’s also good, she says, for drizzling on vegetable or dipping bread. For the grilled cheese sandwich, the outer surface of the bread is brushed with the garlic-infused oil before the sandwich goes into the frying pan. 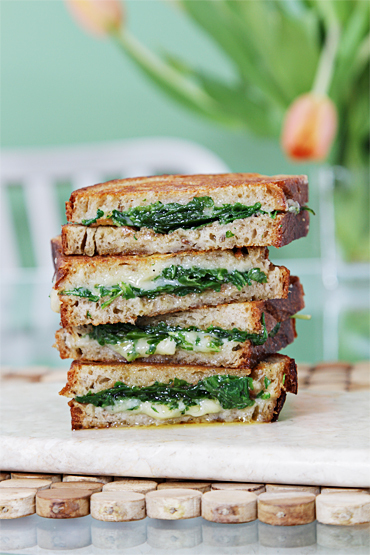 In addition to the garlic confit, the inside of the grilled cheese includes “zingy” baby arugula and a “nutty, pungent” aged cheddar, gruyère or fontina.